The compact Multilog IMx-8 from SKF offers sophisticated condition monitoring for a multitude of industrial applications. 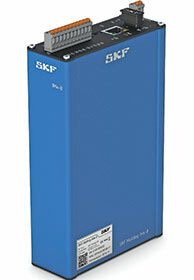 This latest 8-channel unit forms part of SKF’s popular IMx-16 and 32 channel machine health monitoring platforms. Initially targeted at the offshore wind and marine sectors, the versatile IMx-8 brings affordable machine health monitoring to a much wider industrial user base. The system is ideally suited for mechanical and fluid power train applications, while the inclusion of an ‘Event Capture’ feature will appeal to machine tool users who require a cost-effective crash detection capability. Taking up less cabinet space compared to the 16 and 32 channel variants, the compact DIN-rail mount IMx-8 is easily installed into instrument cabinet enclosures, often alongside existing instruments. Suitably housed, it also serves space-restricted applications such as small-size marine thruster pods or direct-drive wind turbines where instruments often need to be located as close as possible to the monitored machinery. Ethernet power and communications and the app-based configuration interface make installation of the IMx-8 extremely easy, most users can set up the system with little or no previous experience. The greatly enhanced internal memory (4 GB as opposed to the 8 MB of previous models) enables standalone monitoring and logging of large amounts of data, which is particularly beneficial for remote applications where routine site maintenance visits are infrequent. Moreover, following a critical event, data can easily be accessed for analysis. The IMx-8 offers a compact, versatile means of monitoring rotating machinery and this cost effective, reduced channel online system fills a large gap in the market, offering features, functionality and flexibility not available anywhere else.